Rigid Steam Beech hardwood construction. Rounded corner design prevents injury while moving around the table. 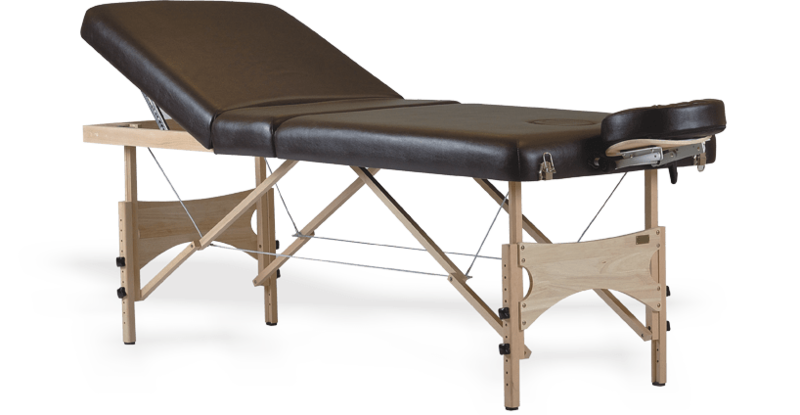 Rubberwood panel at both ends provide additional strength to your massage table for deep tissue massage. 3.5” multilayer foam padding with 2.5” of Memory Foam padding. Dual knobs on each leg for added safety & strength. Soft, durable, high quality leatherette upholstery that is easy to clean. Rubberwood panel at both ends – suitable for deep tissue massage. 2.3”/40 Density multilayer foam padding of high tensile strength. Reiki panel at both ends of the table. Removable armrests in beech wood. Detachable contoured Memory Foam face cradle. Flexibility to manually adjust the backrest. Rigid Steam Beech hardwood frame & legs. 3”/40 Density multilayer foam padding of high tensile strength. Rubberwood panel at both ends ensure professional strength. Detachable contoured Memory Foam face cradle can be attached at either end of the table. Additional face hole cutting with face hole plug. Lightweight anodized aluminium structure for easy transport & mobility. 2”/ 40 Density multilayer foam padding of high tensile strength. Quick height adjustment by push of a spring loaded button. 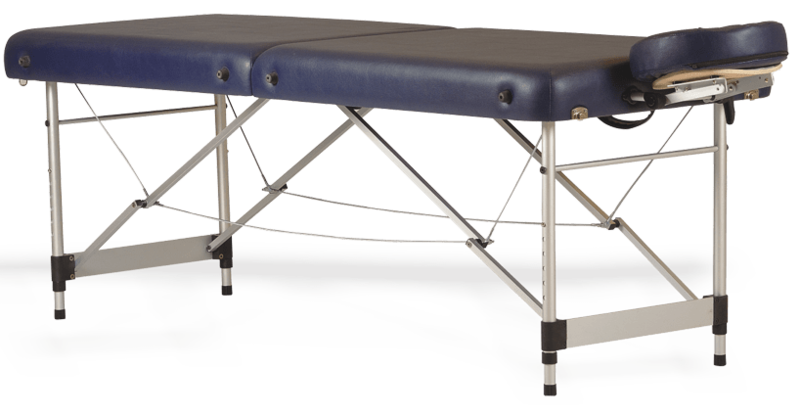 Aluminium supports at both ends provide additional strength to your massage table. 4” multilayer foam padding with 2.5” of Memory Foam padding. Reiki panels at both ends – suitable to sit and work at either end of the table. Specially designed to support client’s abdomen. 2” high quality firm foam padding on seat and knee pad areas. 2” high quality softer foam in the chest & armrest areas. Contoured Memory Foam face cradle that can adjusted on various positions. Easy adjustments on seat & chest support makes it comofortable for people of all sizes. 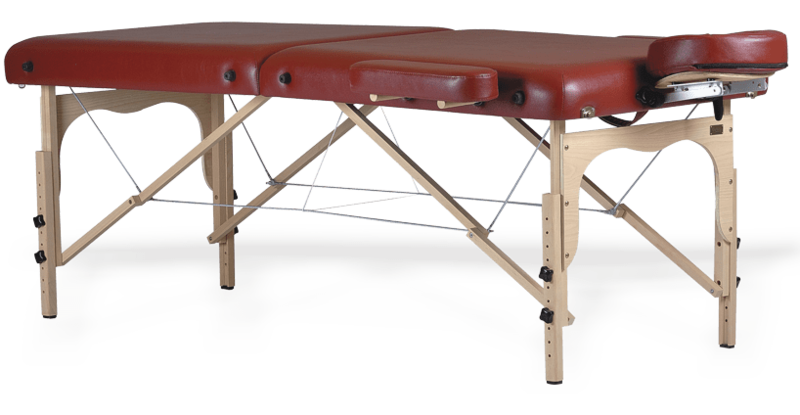 Our special ergonomically designed portable massage tables are high on comfort & durability . They are very easy to setup, fold & store. All our tables are crafted from German Steam Beech Wood , come with ultra-soft PU cushion and are upholstered to perfection in a variety of leatherite colors. All portable tables come with a free carrying case and we offer lifetime service guarantee for our products. Best selling portable massage table for personal & professional use. 40 Density soft foam cushioning. Solid rubber wood panels on both ends make it suitable for general massage & deep tissue massage. Luxury portable massage table for personal & professional use. Delux Akriti is 30” wide. Visco elastic Memory Foam cushion. Premium soft to touch leatherette used in this table. Option to attach face cradle on both ends of the table. Best suited for Reiki & Healing Therapies. Reiki panels at both ends of the table. 30” wide, wider than normal massage tables that are 28” wide. Good option if you want multipurpose table that can be used for Reiki & general Massage purpose. Specially designed for physiotherapists & sports massage therapists. The backrest can be inclined upto 45-55 degrees. 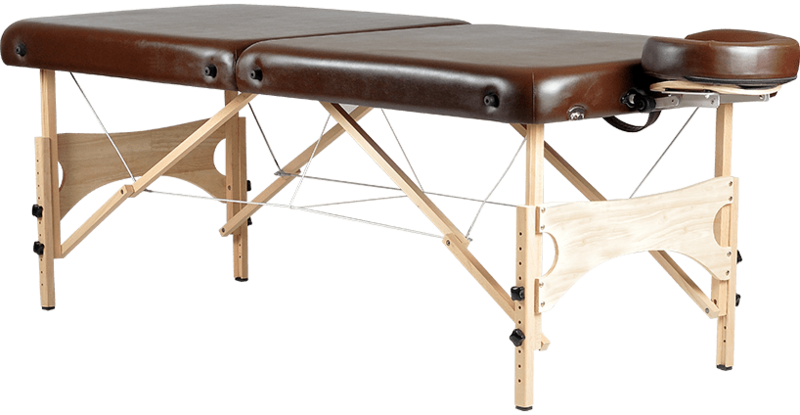 Solid rubber wood panels on both ends make it suitable for deep tissue & sports massage. Dual options of adjustable face cradle and face hole cutting in the table with face hole plug. Backrest incline mechanism from Hettich Germany. The face cradle can be attached on both sides of the table. Most suitable for Neck & Shoulder Massage. Unique design allows easy access to client’s lower back. Portable and occupies less space. 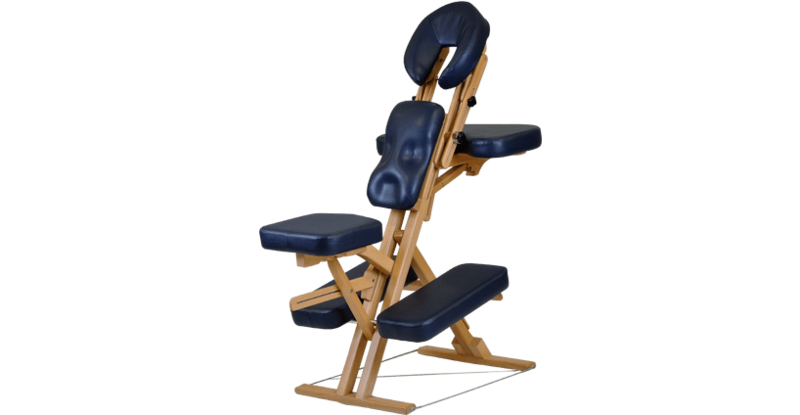 Easy adjustments, durable and extremely comfortable chair for neck and back massage. Specially designed to areas for expectant mothers. Massage Therapy is becoming popular day by day as number of people want to take massage to get relief from postural stress and rejuvenate their bodies. Massage is no longer restricted to Hotels, Ayurveda Centres or Day Spas. Lot of people have engaged massage therapists to provide them good massage in the privacy and comfort of their homes. We at Esthetica believe in the power of human touch to heal the stressed out bodies. A good massage session not only requires a trained Massage Therapist but an ergonomically designed massage table, accessories and equipment. 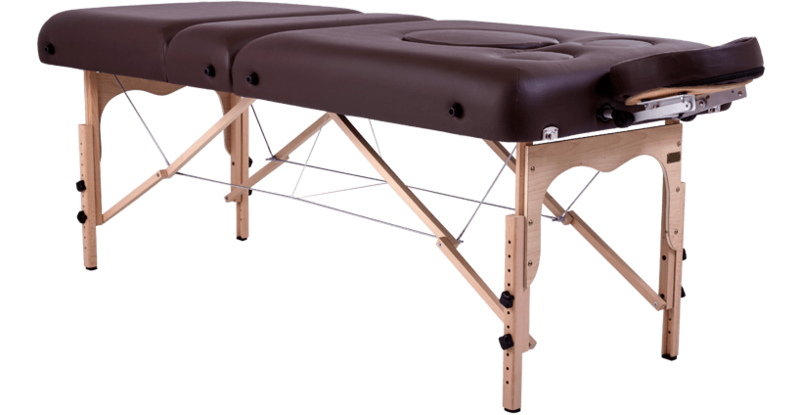 Our Portable Massage Tables are designed to give maximum comfort to the client by using soft and supple foam cushion, crafted from German Steam Beech wood and upholstered to perfection in variety of leatherette colors to choose from. We recommend our massage tables for professional and personal use as they are strongly built, modern design, functional and easy to set up. Stationary Massage Tables are solidwood in design and are best suited for day spas or if you have a dedicated spa room in your house. These tables are stronger & have higher weight taking capacity. Folding Massage Tables on the other hand are popular as they are much cheaper in price so good intial investment for you , folding design makes them easy to store in your house or apartment when they are not in use, easy to carry and set up for massage. A good portable model will weigh less than 30 lbs and the frame can either be made of hardwood or metal. The table must offer ease and convenience in setting up and breaking down and it must be designed for strength and especially stability in all situations. Esthetica is one of the leading manufacturers of spa furniture in India. Combining innovation, expertise and latest wood working machines, we are committed to create spa furniture that this modern, functional & aesthetically appealing. Our manufacturing unit is located at Industrial Modern Township of Manesar in Gurgaon. Our products are currently being exported to Europe, Middle East and Asia. We are quality certified company dedicated to using the best raw materials and manufacturing practice. © Esthetica Spa and Salon Resources Pvt. Ltd.